Challenge yourself to pick up all the bells of one color before your opponents. 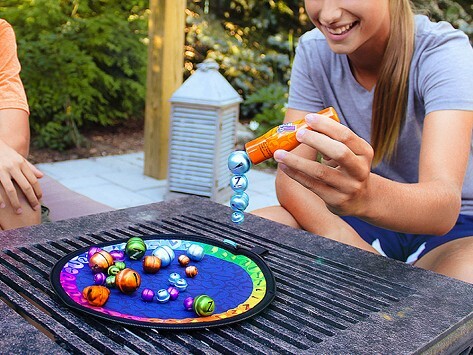 Bellz is simple to play and cleverly contained in its own carrying case, which unzips to become the game board. It’s a simple game that’s much more challenging than it looks. This is a tough game to win, but after some practice we did quite well. We enjoy the challenge. This will be a Christmas gift for my eldest grandson,Hope he likes it half as much as me! Steadily wield a magnetic wand and you may master Bellz. This simple but challenging game tasks you with picking up all the bells of one color. Unzip the tidy carrying case, and it cleverly turns into the Bellz playing board. Waiting there are four different colors of bells, each in various sizes. Use the magnetized wand—carefully choosing the stronger or less powerful side—to attract your bells. If you pick up bells of any other color, which can easily happen, your turn is over. It’s a balance to decide whether to push for removing several bells at once, or to play it safe and remove one at a time. 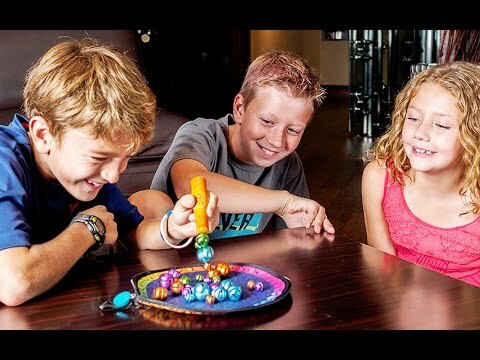 Bellz is a family fun game from Wiggles 3D, the creator of other Grommet favorites like Randomonium. It’s easy to bring along and play anywhere. And with Bellz, patience and an unwavering hand are each a virtue.